“You have to understand that everything you do [on the Internet] now is going to be there forever, is going to be searchable, is going to be reproducible and is going to be broadcast around the world,” said Howard Rheingold during a discussion about his latest book, “Net Smart: How to Thrive Online” at Braun Auditorium Thursday evening. 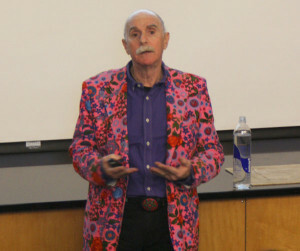 Rheingold has written four books, including his latest, and has served as editor for several publications. He currently teaches “Virtual Communities and Social Media” at Stanford. “Instead of confining my inquiry to ‘Is Google making us stupid?’ ‘Is Facebook commoditizing our privacy,’ or ‘Is Twitter chopping our attention into microslices’ — all good questions — I’ve been asking myself and others how to use social media intelligently, humanely, and above all, mindfully,” Rheingold wrote in an email to The Daily. His lecture Thursday focused on a summary of what he called the five essential literacies of social media: attention, participation, collaboration, critical consumption and network know-how. Rheingold summarized each of these literacies into a few points. They ranged from remembering to breathe while reading one’s email to the idea that one should “triangulate” while passing around information on the Internet — that is, find three good sources that confirm the piece of information before passing it on. “The biggest thing I’m going to take away is something I think me and my friends forget a lot: to make sure we’re not in that ‘echo chamber,’ we’re not listening to opinions that are like our own,” said Crystal Nwaneri ‘13, reflecting on a point Rheingold made about critical consumption. Both students said they feel they will be taking steps toward being more mindful about their use of social media. “One of the great things about the Internet being almost shallow is that it’s not that hard to simply change your practices,” Nwaneri said.